Review: Eddie is a troubled teen who is more concerned about the next fight instead of the future he could be able to create - that is until he meets Lupe. Lupe, a young woman who has transferred from another school in order to get away from bullying, is smart and beautiful - and she quickly sees that Eddie is much more than what he seems to be on the outside. She and Eddie begin dating and gradually Eddie starts to see himself in a very different light. He no longer is the hopeless teen that is just figuring out how to prolong the inevitable jail time, but rather a worthwhile contribution to society. But, Eddie's path to success isn't an easy one, and certainly there are bullies and troubled family members to make life difficult along the way. But, with Lupe's confidence and Eddie's mother's wish for him to be the first Corazon to go to college, Eddie slowly begins to appreciate life and more importantly himself. MUCHACHO takes a hard look at the callousness of life and shows that hope lies just below the surface. We would like to thank Random House for providing a copy of DWEEB: Burgers, Beasts, and Brainwashed Bullies for this review. 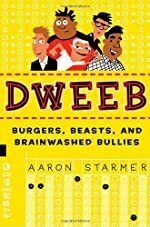 Have you read DWEEB: Burgers, Beasts, and Brainwashed Bullies ? How would you rate it? Love your review! I agree, from what you said, this sounds like it would be a terrific series book. The characters sound like they would make a good team to solve future mysteries. Maybe the author will change his mind and bring back the characters in a future book!